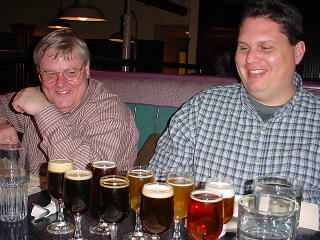 In mid January of 2002, Owen Ogletree, Kerri Allen, Lari Cowgill, and Thel Melton blew into the windy city for a tour of some of the best beer spots that central Chicago has to offer. This list is not comprehensive -- and since opening times change often, you should be sure to call ahead before visiting. The places we visited are commented on below. E-mail Owen with your additions and/or comments. Beers: The main location on N. Clybourn had an impressive 12 house beers on tap when we visited. Our favorites were the flavorful Honkers Ale, Robert Burns Scottish Ale, Bourbon County Stout (10% alcohol and aged in bourbon barrels), Old Aberration Barley Wine (9.5%), India Pale Ale, and Doppelbock (9%). 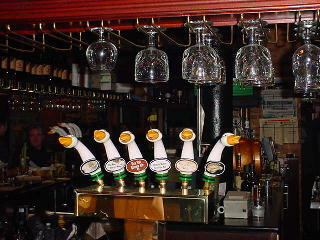 They also offer cask conditioned selections that are very good. The N. Clybourn brewpub gives $3 brewery tours on Sundays at 3 pm. Comments: The atmosphere, beer, and food at Goose Island continues to be wonderful. Be sure to try their homemade potato chips and great sandwiches. The Wrigleyville location also displays fun baseball murals. Lari and Thel marvel at the samples! Beers: Golden Arm Kolsch, West Side Wheat, Gentrification Ale (light bodied, unfiltered, great dry hopped aroma), IPA (big malty ale with lots of hops), Dolomite American Malt Liquor, Worrying Ale (English style ale - mild and fruity), and Flat Iron Stout (flavors of chocolate, roasted barley, and oatmeal). Comments: These beers were rich, flavorful and right on style! This is an attractive new brewpub that also features ten guest drafts and nine bottled selections. The bottled beers had a Belgian emphasis. The head brewer is Jonathan Cutler (formerly of Goose Island and Sierra Nevada). If you are a true beer fan, head to Piece. Their unique, gourmet pizzas are quite good and unique to the Chicago area. The waitress at Piece explains the sampler to Lari. 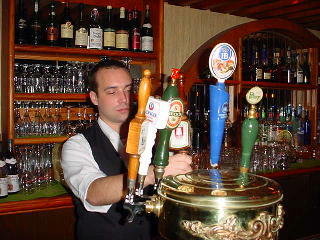 Beers: Most of the beers here are lighter German Pilsners and other lagers -- all very fresh and flavorful. Be sure to try the rye bread sticks with your lager (yum!). Prosit! 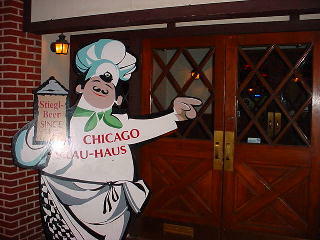 pride themselves on the Brauhaus' live music, bar with German lagers, and authentic cuisine. The restaurant has been in the neighborhood for 35 years. Food includes schnitzel, sauerkraut, sauerbraten, knackwurst, Westphalian ham, Sheboygan bratwurst, and smoked Thueringer sausage. Beers: Great high gravity selections including Bells, Anderson Valley, and Rogue. 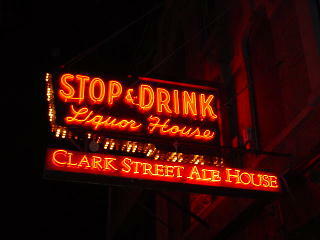 Clark Street has 25 draft beers and over 30 bottles. Comments: Beautiful bar with dark wood is complimented by the murals at the back of the pub. 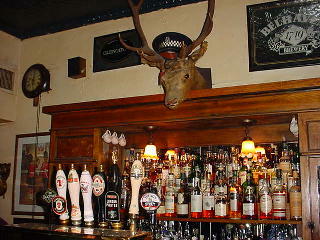 Beers: This nice Scottish pub features a good selection of beers imported from the UK. The most flavorful ales are from Young's in England. Comments: A big selection of single malts is here along with a tasty English menu of fried items, fish and chips, and chicken wings. The bar up front and dining room in back can be quite crowded. Beers: Standard list of fine Rock Bottom beers from around the country. Comments: Very nice location in the center of downtown. Pale Ale and Stout were my favorites. The cask conditioned ales at this location have ranged from marvelous to a bit stale at times -- ask for a small taste before you order a pint of the cask beer. Beers: This was one of our favorite beer bars we visited! What an incredible selection of Belgian beers! Try the Westvleteren, Oerbier, Affligem Noel, Fantome, Cantillon Lambics, Hanssen's Lambics, Rochefort ales, and the Tripel Karmelite. 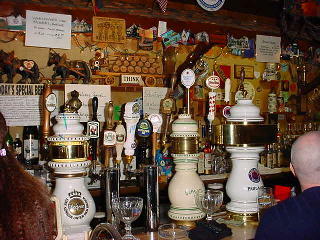 Comments: Hopleaf is putting in a kitchen soon that will serve Belgian food and is expanding to 30 taps in July of 2002. The old cash register and jukebox are delightful. 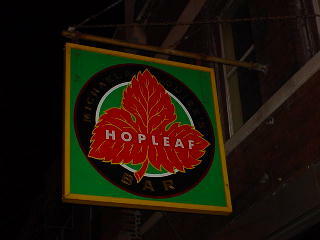 Be sure to visit Hopleaf. Beers: Map Room is famous for one of Chicago's best beer selections. Microbrews, English and Belgian Ales, and a cask selection can all be found here. We were surprised that the bartender would not give us a small sip of the cask beer to make sure it was fresh (quite odd). Comments: Take the blue line "L" train to Damen stop and walk north up Damen to Armitage. Go left (west) on Armitage one block to Hoyne and the Map Room. 2034 W. Irving Park Rd. 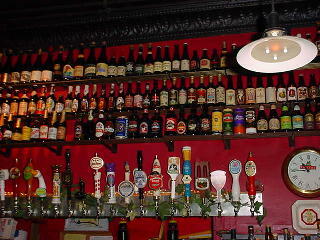 Beers: Resi's has an extensive selection of German and other imported beers (including some Belgian Trappist Ales). The German Adventinus Weizen Bock is rich and delicious. Comments: This casual place has great (meaty) dishes, fantastic service, and is a favorite with the locals. Abbey Pub and Restaurant, 3420 W. Grace, (773) 463-5808. Nice Irish pub on the northside. Four Farthings, 2060 N. Cleveland Ave. at Lincoln, (773) 935-2060. Very nice neighborhood bar with pool tables in the back. J.T. Collins Pub, 3358 N. Paulina St., (773) 327-7467. 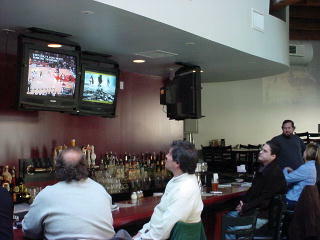 Some good beers on draft -- can be smoky, crowded, and noisy during big sports games. John Barleycorn, 658 W. Belden, (773) 348-8899. Large English-style pub with large bar and restaurant. 3-4 nice beers on draft, and a nice selection of bottles. Sheffield's Wine and Beer, 3258 N. Sheffield, (773) 281-4989. Fantastic bar with an impressive list of beers! They have beer tastings, a beer society, and a nice house cat.